Adventure through enchanted woods and eras long past with the Medieval Forest Cloak. This handmade historic cloak is reversible, and it features an elegant front twist and button closure at its neck revealing both of its colors. Its voluminous folds, full length, and dramatic hood lend its wearer an air of mystery. 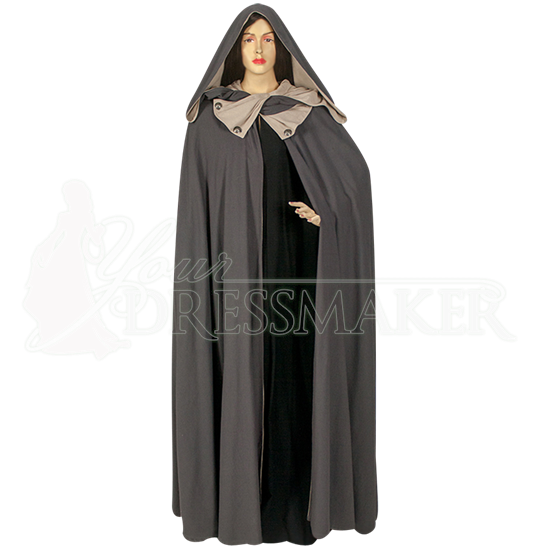 Made from 100% woven cotton fabric with a medium weight, this medieval cloak is comfortable and stylish, making it a fantastic essential for any reenactment wardrobe. Along with its two color options, its cotton construction makes it easy to wear and versatile, sure to suit a variety of historic styles. Choose from a selection of color combinations, and wear the Medieval Forest Cloak to your next Renaissance festival, medieval or fantasy LARP event, historic reenactment, or other costumed event. 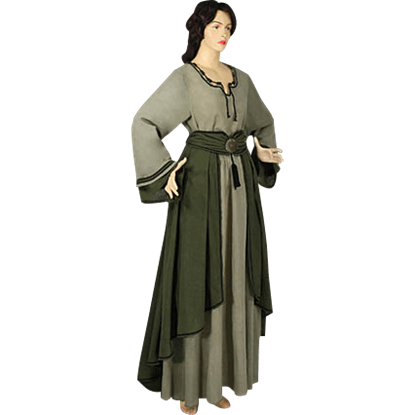 The Lady's Saxon Style Dress is a great outfit for a woman who not only wants to look pretty, but also wants something that can be worked in, if need be. This simple yet attractive dress is made entirely from light-weight Muslin cotton.